I am such a huge fan of Etsy! You can seemingly find everything you could ever want (or didn't even know you wanted) on Etsy. For those unfamiliar, think of it like one big market where small boutique owners, crafters, etc. can go and sell their items. 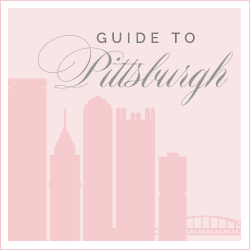 From custom linens to vintage treasures, there is SO much available. I thought it would be fun to round up some of my Etsy finds and share them with all of you! Monogrammed Shower Curtain// This is on my list to purchase for the new house since we have a Jack and Jill bathroom that as a bathtub so it needs a curtain! Set of Delft Coasters// I ordered something similar as a dish to set in the bathroom when I take off my ring. Delft is so gorgeous and you can find so many great Delft pieces on Etsy! Monogrammed Coasters// I have these in my bedroom. They're awfully expensive for coasters but the custom look really is stunning! Dog Hat// I got this for both my dad and my fiance! They have so many different dogs to choose from. Monogrammed Bolster Pillow Cover// I have this and the quality is so beautiful- looks like you got it from a high-end brand like Matouk! 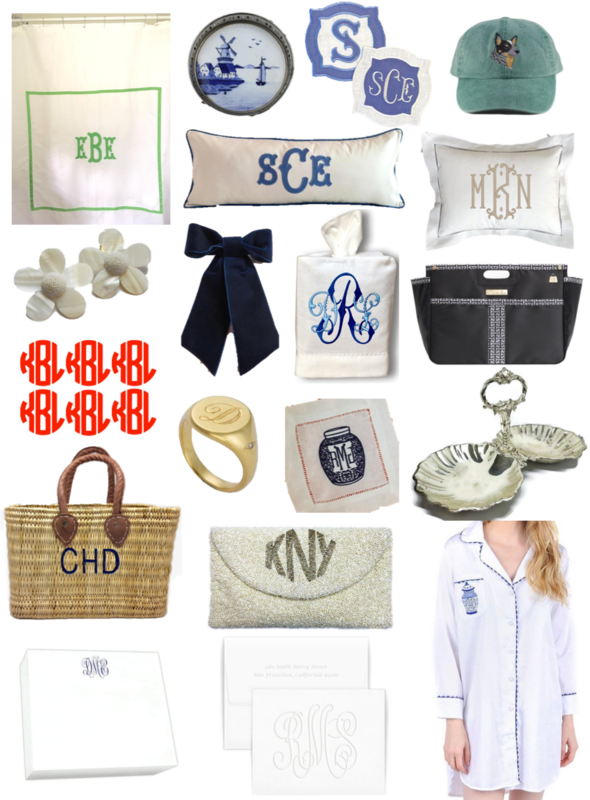 Monogram Hemstitch Pillow// I also have two of these pillows! One as an accent for an upholstered chair that I have and the other that acts as a back support pillow for my desk chair! Flower Earrings// These remind me so much of the pricier Rebecca de Ravenel earrings but for much less! Navy Velvet Hair Bow// I can't get enough hair bows and there are endless options on Etsy! Monogrammed Tissue Cover// I never let a tissue box go bare- I learned this from my mom. These covers are beautiful and make great gifts, too! Tote Organizer// This is such a game changer in the organization department! I love huge totes but with that, it becomes hard to find and organize everything I am toting around. These give your bag a little more shape as well as create storage for everything! This Etsy shop has so many different sizes to fit all sorts of different bags! 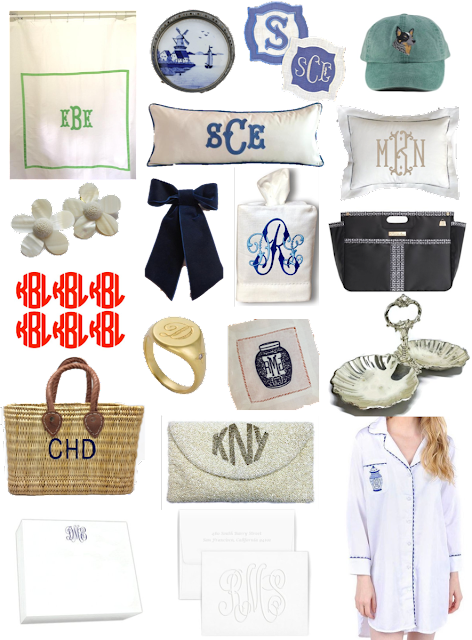 Monogrammed Decals// I have one of these on my computer but I love the idea of keeping them on your chargers so you never misplace them and always know which is yours! Signet Ring// I wear my monogrammed signet ring every single day. I love it and it is such a classic piece of jewelry. Ginger Jar Cocktail Napkins// I just ordered these because I thought they were too cute!! Silver Dish// You can find a lot of great vintage silver items on Etsy. Think trays for serving, trinket dishes, etc. Straw Basket// Isn't this so darling for spring/summer? The monogram is adorable. Beaded Clutch// Love love love these! They are so gorgeous and so special with all the different designs and monogram options. Super Slab Notepad// I just ordered this because I LOVE a good notepad but I don't like lined notepads. I like the freedom to create all sorts of doodles and notes! Embossed Note Cards// Aren't these just gorgeous? So simple and elegant. Ginger Jar Night Shirt// This one is so much fun and a great gift to give someone who seemingly has everything!